A razor-sharp and deeply felt novel that illuminates the pivotal role of work in our lives—a riveting fusion of The Nest, Up in the Air, and Then We Came to the End that captures the emotional complexities of five HR colleagues trying to balance ambition, hope, and fear as their small company is buffeted by economic forces that threaten to upend them. Rosa Guerrero beat the odds as she rose to the top of the corporate world. An attractive woman of a certain age, the longtime chief of human resources at Ellery Consumer Research is still a formidable presence, even if her most vital days are behind her. A leader who wields power with grace and discretion, she has earned the devotion and loyalty of her staff. No one admires Rosa more than her doting lieutenant Leo Smalls, a benefits vice president whose whole world is Ellery. While Rosa is consumed with trying to address the needs of her staff within the ever-constricting limits of the company’s bottom line, her associate director, Rob Hirsch, a middle-aged, happily married father of two, finds himself drawing closer to his "work wife," Lucy Bender, an enterprising single woman searching for something—a romance, a promotion—to fill the vacuum in her personal life. For Kenny Verville, a senior manager with an MBA, Ellery is a temporary stepping-stone to bigger and better places—that is, if his high-powered wife has her way. Compelling, flawed, and heartbreakingly human, these men and women scheme, fall in and out of love, and nurture dreams big and small. As their individual circumstances shift, one thing remains constant—Rosa, the sun around whom they all orbit. When her world begins to crumble, the implications for everyone are profound, and Leo, Rob, Lucy, and Kenny find themselves changed in ways beyond their reckoning. Jillian Medoff explores the inner workings of an American company in all its brilliant, insane, comforting, and terrifying glory. 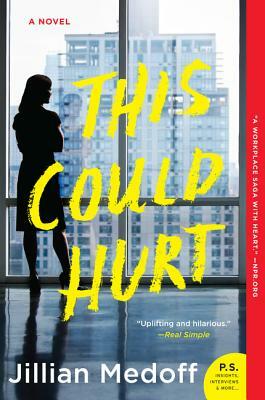 Authentic, razor-sharp, and achingly funny, This Could Hurt is a novel about work, loneliness, love, and loyalty; about sudden reversals and unexpected windfalls; a novel about life. Jillian Medoff is the author of the national bestseller I COULDN'T LOVE YOU MORE, as well as the novels GOOD GIRLS GONE BAD and HUNGER POINT. A former fellow at MacDowell, Blue Mountain Center, VCCA, and Fundación Valparaiso, she has an MFA from NYU. In addition to writing fiction, Jillian has a long career in management consulting and is currently a Senior Consultant at the Segal Group, where she advises clients on all aspects of the employee experience.